Last week while I was doing the very important work of riding trains and kayaking in mountain lakes and hiking and playing board games, all my internet theology friends were talking trinitarianism across multiple platforms from various nations. Since I can’t figure out the correct angle at which a latecomer can enter the fast-moving discussion, I thought I would just post a few theses that, while prompted by the current discussion, can stand more or less on their own. But you could also consider this an overgrown subtweet at the whole world. 1.The reason we know the Father-Son-Holy Spirit distinction is because the Father sent the Son and the Holy Spirit. The distinctions among the three persons were revealed in the act of the Son and Spirit coming to be among us for our salvation. The Old Testament may be full of hints and foreshadowings and resonant suggestions, but it is not full of clear statements that the one God is Father, Son, and Holy Spirit. 2. But the Father-Son-Holy Spirit relation pre-exists the sending of the Son and the Holy Spirit. God was Trinity before showing it. How long before showing it? Forever. Why did God keep this trinitarian revelation in reserve? Because it was not relevant until the fulfillment of the promise of redemption was manifested. 3. In fact, the Father-Son-Holy Spirit relation is essential to the being of God. Unless God changed in essence in between the OT and the NT, the one God of Israel must be the Father, Son, and Holy Spirit. Bonus Bible Bundle: This is not only the biblical reason why the Trinity is one God, but also the trinitarian reason why the OT and NT are one book. If triunity is true now, it must always have been true. 4. The Sender-Sent relation enacts and reveals an eternal relation of fromness. The Father sent the Son in the fullness of time, by grace, because the Father is the source of the Son in eternity, by nature. This eternal relation of fromness has traditionally been called eternal generation. It can also be called filiation (“sonning”), especially because it needs to be distinguished from the Holy Spirit’s own relation of origin which is revealed in his own sending. 5. Eternal generation is a biblical doctrine. There’s no reason to believe this kind of thing about God unless it is revealed in his mighty acts and his self-testimony. It is not directly stated in scripture in these words, any more than a “Trinity” of “persons” is, but many lines of biblical evidence converge on this judgment about the relation of Father to Son and Spirit. Perhaps it has been too long since we have seen a vigorous presentation of this doctrine from scripture alone. 6. Eternal generation is also a classical doctrine of the Christian church. It is a central doctrine, confessed by the main voices in the history of doctrine. The agreement on this point is striking: East and West, Catholic and Protestant, Anglican and Baptist, you name it. Christians have always confessed God as Trinity, and they have always done so on the basis of the biblical doctrine of eternal generation. If you wanted, theoretically, to be trinitarian without affirming eternal generation, you would have to label your belief “Trinitarianism 2.0,” because it would be a significantly different way of reading the Bible and believing in the Trinity than what had gone before. 7. Eternal generation does a lot of work in theology. God’s unity is so fundamental for biblical doctrine that even face-to-face with the incarnation, and even after Pentecost, we have to admit how difficult it is to conceptualize what we have been shown and told. What kind of distinctions in the divine being could give us the one God incarnate and conversing as Son to Father? What realities in the very being of God must be showing themselves among us? What can we say that will not land us in Arianism (Sender is creator of Sent) or modalism (Sender is Sent, but different-like). The safest, surest, most biblical answer is that behind the incarnation of the Son and the outpouring of the Holy Spirit stand eternal generation and spiration. If you try to run trinitarian theology (2.0) without these, it will be very difficult to make distinctions that account for the relation of the Sender and the Sent. 8. To affirm the Trinity without affirming eternal generation is to affirm the results of patristic biblical reasoning minus the process and presuppositions that produced them. What is the result? The result is the belief that there is one God who exists eternally in three persons who are coequal, coeternal, and distinct from each other; one of these persons is the eternal Son who added to his divine nature an assumed human nature, which created nature is less than and lower than the Father. That is a pretty robust set of beliefs about the trinitarian-christological core of Christian faith. Critics should critique accordingly, with a sense of proportion. My own first line of criticism would be to point out that without eternal generation in place, the relations of these three to each other is still a thing to be sought. To that extent, all these orthodox statements remain brittle and abstract, crying out for explanation and application. Most explanations (eternal relationships of command and obedience, for example) and most applications (gender order) that suggest themselves seem poorly resourced and arbitrary. 9. Supplementing eternal generation is very different from replacing eternal generation. Advocates of “Eternal Functional Subordination” or “Eternal Relational Authority-Submission” differ from each other on this count, and it is one of the most important differences. There are also differences between those who presuppose eternal generation but don’t think it does much for them, and those who presuppose it and also think it is fruitful for their own interests. Time may tell that the group of theologians we think of as united in this EFS/ERAS/complementarian coalition have less in common with each other than they seem to, both methodologically and substantively. For the supplementers, it may be possible to describe the doctrine of eternal generation in so thick a way that it comprehends a further relational taxis and warrants extension to the incarnation. 10. The doctrine of the Trinity suffers equally from flattening out the distinctions among the persons and from over-drawing them. 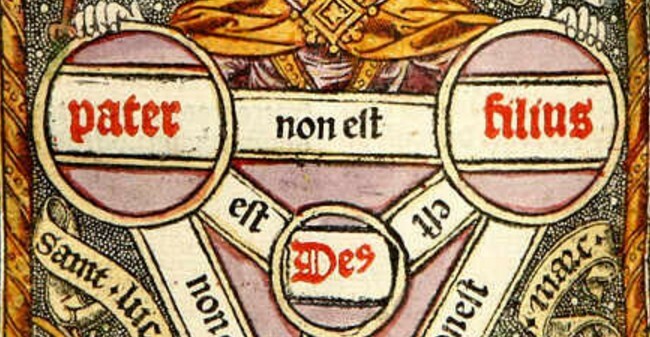 This is true in all epochs of trinitarian theology, but in our age, whenever trinitarianism is drawn into the orbit of gender politics we have two poles: An egalitarian round-dance of mutual affirmation by the anonymous three in their perichoretic commune of blissful sameness on the one hand, and a hierarchical committee in which the lower members are strictly observant of the proper channels for carrying out the deliverances of the senior members on the other. Okay, nobody’s doctrine of God reaches these extremes. But we seem to feel the pull of the poles. And we can tell which extreme any particular theologian most dreads by whether they feel reassured by adding or subtracting hierarchy. 11. It is a long and winding way from the doctrine of God to the doctrine of human society. Biblical categories like “image of God” don’t make the way more direct. Conceptual analyses of things like society or community don’t make the way less winding (they rather introduce considerable new kinks). The phenomenology of persons in relation doesn’t serve to throw a net over both things by which we can draw them together. You can get from there to here by following a carefully-marked map across the whole territory of the economy of salvation, down from the heights of the divine attributes, through the valley of incarnation and christological anthropology, into the redeemed fellowship of the many and the one. 12. 1 Cor 11:3 is not a shortcut. It’s a bona fide hard passage, but mostly it’s about the incarnation. 13. Connecting Trinity to gender roles is a dangerously distracting pedagogical gambit. It bundles the doctrine of God with another set of commitments. To the extent that the doctrine of the triune God already seemed distant and abstract, this bundling strategy becomes the central importance of trinitarianism. I know students who learned nothing from Trinity lectures except that the doctrine does or does not support egalitarianism or complementarianism. Of course I can blame the students for selective listening and motivated non-retention. But it also makes me think that including this topic in Trinity lectures is a very bad idea. Catechesis is too short for these dalliances, and the Trinity is too busy to serve as the transcendent ground of gender. 14. Imitating the Trinity as Trinity is not a biblical way of talking. We are told to imitate God the Father in his relationship to humanity; to be imitators of God as beloved children; to be perfect as our Father in heaven is perfect (sending his rain on the just and the unjust). But most of the equipment of trinitarian theology points to ways in which God differs from us, not ways in which God is like us. And if we undertake to imitate God as Trinity, we seem to face a wide open field of applications: sexual, social, financial, governmental, ecclesiastical, and so on. All of these have been offered. The footnotes are wearisome. 15. Friends don’t let friends settle for social trinitarianism. At least not the kind of hard social trinitarianism that trades on separate centers of consciousness filled with distinct knowledge sets, separate wills that must be harmonized by agreement, and separate roles to play in a shared enterprise called the life of God. There is a kind of social trinitarianism that comes from an impressionistic reading of the New Testament undisciplined by the massive Old Testament insistence on divine singularity and simplicity. By failing metaphysically to suggest monotheism, it is fruitful of many errors. It is most dangerous where it is most commonsensical. Unless social trinitarian impulses are carefully aligned with God’s utter oneness, disputes about eternal functional subordination are the least of the problems we should expect to arise. 16. It is hard to talk well about the Trinity. I’m thrilled that lots of people are talking about the Trinity this week, and I don’t want to run anybody off from the conversation. Every week I sit around the house making sentences like the ones in this post, whether they will ever find readers or not. But there is a reason trinitarian theologians are cautious in their speech, and that reason is the extreme difficulty of doing justice to these matters without misleading hearers. The Trinity is about persons in relation in a certain taxis, not about people in relationships with certain roles. What is the difference between persons and people, relations and relationships, taxis and roles? We should talk about that. But notice that every time you say “three persons” instead of “three people,” you are registering in ordinary language your sense that the matters on the God side of the equation are high and lifted up. Sometimes theologians are overly prissy about their special theological vocabularies (why is taxis better than order if it’s just the Greek word for order?). And sometimes they obfuscate. Sometimes they’re boring because they’re boring. But other times they’re boring because they refuse to give the quick answer to current hot topics because the questions are hopelessly wrongheaded and some things need to be left unsaid. 17. Many salvation-historical phenomena have an immanent-trinitarian analogate. Here is an almost-magical formula for lifting up your mind to properly theological realities: Ask “what is the immanent-trinitarian analogate of _____?” Jesus prays to God. What is the immanent-trinitarian analogate of prayer? It can’t just be prayer. How could we envision the eternal Son formulating requests and directing them to the eternal Father? It must be some interchange of request and response that are mutually necessary to each other yet ordered sequentially yet not temporally. Jesus obeys the Father. What is the immanent-trinitarian analogate of obedience? It can’t just be obedience. With what commanding will would the eternal Father draw forth submission from the obeying will of the eternal Son? It must be some eternal reality essential to the divine life, some coming-forth of Son from Father. I would never say the eternal Son obeys the eternal Father, or that a structure of command and obedience characterizes the divine being. I might say the immanent-trinitarian analogate of the Son’s obedience is his eternal generation. Maybe. But since that would be working backwards (I just inserted eternal generation on the right-hand side of the equation because I already suspected it was the answer before I checked the left-hand side), I’d have to subject the term “the Son’s obedience” to quite a bit of conceptual clarification. Tell me about the Son’s will(s). The theological questions really at issue have no significance except on a certain level, a high level, of the spiritual life; they could have been fruitfully debated only between mature and saintly disputants in close privacy and at boundless leisure. Under those conditions formulae might possibly have been found which did justice to the Protestant –I had almost said the Pauline– assertions without compromising other elements of the Christian faith. In fact, however, these questions were raised at a moment when they immediately became embittered and entangled with a whole complex of matters theologically irrelevant, and therefore attracted the fatal attention both of government and the mob. When once this had happened, Europe’s chance to come through unscathed was lost. It was as if men were set to conduct a metaphysical argument at a fair, in competition or (worse still) forced collaboration with the cheapjacks or the round-abouts, under the eyes of an armed and vigilant police forced who frequently changed sides. That does remind me of the current discussion; though, as I said, I’m always glad to see earnest inquiry into the doctrine of the Trinity.